This is one of my favorite pictures. 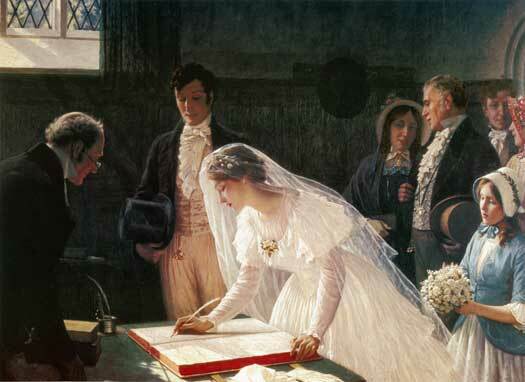 It’s titled, “Signing the Register” and the artist is Edmund Blair Leighton. Mr. Leighton died in 1922, so the picture is in the public domain. I love the picture for the beautiful story it tells of marriage and the importance placed upon the marriage committment . . . or vow . . . or covenant through all of human history. In preparation for my class at the UHEA Convention on June 8 and 9, I have studied a little about how the marriage vow, marked with a ceremony, establishes a new family and confers upon the husband and wife the expectation and authority to live together in love and to bring children into the world. The parental responsibility is to provide for, protect, nurture, and govern the children. If a family exists and a home exists, the home is a school. The earliest and most important learning happens at home. Even if the children leave home on occasion for some of their learning, the office is at home. The decisiosns are made at home. The responsibility resides at home. This answers the big question: WHY should every family take responsibility for the education of their children? Does the State also have a role in the education of children? We’ll discuss that issue and how current events are reshaping our world. The second question is WHAT is “education”? What are the principles? As we discuss a few of them, I will suggest that parents make a “spiritual blueprint” of their homeschool before creating it in physical reality. We might put our blueprint in a notebook, which we might call the Book of the Family or the The __ Family Handbook. The book would contain the family purpose and authority, the path the family will follow, and whatever else the parents feel should be included. If the book is often used, and maybe if each child has his own copy, it should give everyone eternal perspective and direction for their lives. I wish I had done this when our children were young. I have thought much about it over the past few years and will bring my ideas to share. I hope you will have ideas to share as well. The blueprint and handbook we create should guide our education. But what should our plan be? Do we follow God’s educational plan? The state’s plan? Some other plan? We don’t want to spend years of hard work only to find our ladder has been leaning against the wrong wall! So we’ll talk about the different educational “walls” that are out there and what subjects are “core” for our families. Obviously I’m campaigning for God’s plan. Actually that plan got buried in the early days of Utah when the children and grandchildren of the pioneers were lulled — and then forced — into government schools. Now it is being restored by our church leaders in far greater splendor than ever before. What we need is the courage to follow it, to move out in the paths that are being and will be shown to us,. Is there an element of the unknown? Of course there is. The Earth is a campus, and we are here to learn and become. Our school assignments should include much that is “new.” Our “homework” should be happy hard work. After the Conference we’ll post reports of what we all learned. If you can come, please do. This entry was posted in Every Home A School, The Book of the Family on May 1, 2012 by Joyce Kinmont.